ROME — As the only candidate for election, FIFA President Gianni Infantino is set to serve four more years as the leader of soccer's governing body. Infantino had the required nomination letters from five of the 211 member federations when the deadline passed at midnight Tuesday in Zurich, FIFA said Wednesday. "Good news for football," Infantino said after arriving at a hotel in Rome, where his former employer UEFA is holding two days of meetings. Infantino, who was also awarded a medal by Russian President Vladimir Putin on Wednesday, must now pass the formality of eligibility and integrity checks for the election on June 5 in Paris. The 48-year-old Swiss lawyer has been widely expected to win unopposed with support already pledged by most FIFA members, including through their continental governing bodies such as North America's CONCACAF and South America's CONMEBOL. He is completing the term of Sepp Blatter, who announced his resignation plan days after American and Swiss prosecutors revealed sweeping investigations of corruption in soccer in May 2015. Blatter was later banned by the FIFA ethics committee for financial irregularities along with Michel Platini, Infantino's former boss at UEFA. FIFA is still studying if that tournament — being played for the first time in November and December — could also be expanded to 48 teams. It would require Qatar agreeing to share hosting duties with regional neighbors because the gas-rich emirate does not have stadiums and infrastructure to cope with the extra games and teams. 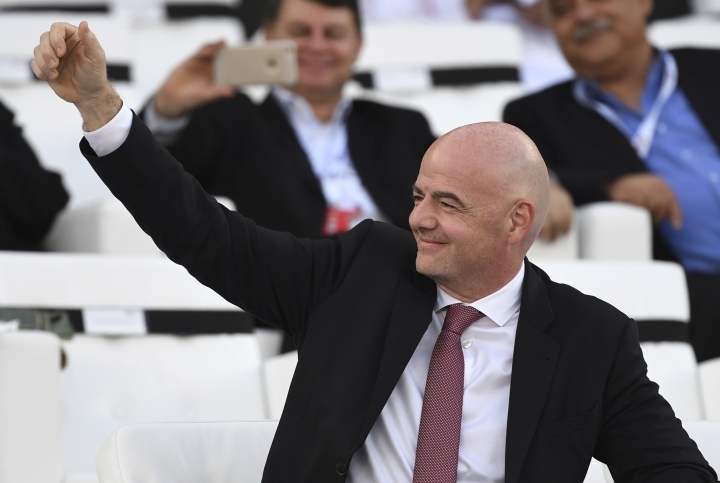 Infantino has acknowledged the 2022 tournament is unlikely to be changed amid the region's current diplomatic tensions. A decision could be taken by the FIFA Council in Miami next month to honor Qatar's original hosting plan. Putin awarded Infantino the Order of Friendship in a decree Wednesday which praised him "for a big contribution to the preparation and hosting of the FIFA World Cup 2018," which was held in Russia last year. There was no immediate word on whether Infantino planned to receive the award in person. The medal is a token of Russian state appreciation for cultural figures and foreign dignitaries. Other recipients include former Cleveland Cavaliers basketball coach David Blatt and former U.S. Secretary of State Rex Tillerson, who at the time was Exxon Mobil CEO.